Heart failure is a common and serious medical condition. Heart failure develops slowly over time as your heart muscle gradually weakens .The “failure” refers to your heart’s inability to pump enough blood to meet your body’s needs. Congestive heart failure is a progressive condition in which the heart’s function gradually deteriorates resulting in diminished cardiac performance and pumping ability. Ultimately, blood flow to the organs is reduced, leading to a variety of symptoms including shortness of breath, lack of energy, swelling, etc. Patients with heart failure often require repeated hospitalizations for treatment and adjustment of medications. Medications have been the mainstay of therapy for heart failure. However, patients with extreme forms of heart failure often remain highly symptomatic despite maximum medical therapy, and face grave risk. Anywhere between one quarter to one half of all heart failure patients have delay in the electrical activation of the heart making the heart walls dys-synchronous and heart pump less efficient. This electrical abnormality, is often called bundle branch block or intraventricular conduction delay, on the electrocardiogram. If you have heart failure, your physician can readily tell you if you have this common abnormality. If present, electrical delay will adversely affect heart function resulting in inefficient pumping action of the heart. This electrical delay in the setting of heart failure is also associated with increase in the risk of death. Recently, major advances have been made in technology that can overcome the problems created by the electrical abnormalities described above. Specifically, a therapeutic intervention termed “cardiac resynchronization” will reverse many or all of these abnormalities. Cardiac resynchronization is accomplished by a procedure called biventricular pacing. 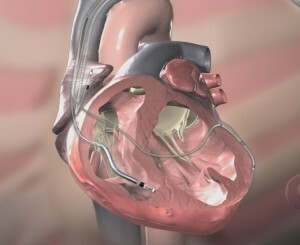 With this procedure, a standard two-wire pacemaker is placed in the right-sided cardiac chambers, and an additional wire is threaded through the vein of the heart to the left lower chamber’s freewall. By stimulating the right and left-sided chambers simultaneously, the heart walls are “resynchronized”. When this is accomplished, the vast majority of patients have improved cardiac function and reversal of the clinical consequences created by bundle branch block. The procedure can be successfully performed in 90-95% of patients with a risk of about 1%. Clinical trials studying thousands of patients have been completed and published. They indicate significant improvement in overall heart failure outcome in patients treated with biventricular pacing devices. Patients report improvement of symptoms and exercise capacity. The hospitalization rates were also reduced. Many patients with heart failure also face a risk of potentially fatal heart rhythms and sudden cardiac arrest. When this occurs, unless a patient is rapidly resuscitated, sudden death usually results. Standard treatment for a patient at high risk of sudden cardiac arrest is an implantable cardiac defibrillator. Biventricular pacing systems can be combined with the implantable defibrillator in appropriate patients to accomplish the dual desirable endpoints of improving heart failure and preventing sudden death. Patients who have an unsuccessful implantation attempt of a biventricular pacing system due to unsuitable heart anatomy, may need placement of the third lead surgically directly on the heart surface. This is generally done by a Heart surgeon in the operation theater of a separate day. This lead is then tunneled and attached to the defibrillator/pacemaker.